Click here to take our online survey, and let us get to know you better. We'll reach back out to schedule an initial consultation appointment for you. Ready to design your perfect invitation? Our job is to help you sort through all of our options until we find you “the one”. Our designers offer endless customizations so if you can dream it we can create it. We know how busy wedding & event planning can be combined with every day stresses so let us guide you to your perfect paper suite. Take our survey, and let us get know your style before you get here. We’ll be able to give you ideas and recommendations based on your likes so we can jump right in during your initial design meeting! ​We see a wide range of prices, because every order is custom tailored to the client's needs. We see most clients spend $1,000-$5,000. There are so many variables to consider when selecting a paper suite (print method, paper type,number of ink colors, number of accessory cards etc..) but we pride ourselves with being able to work with most budgets and with being able to design exquisite, one-of-a-kind invitations for the most refined events. Yes. 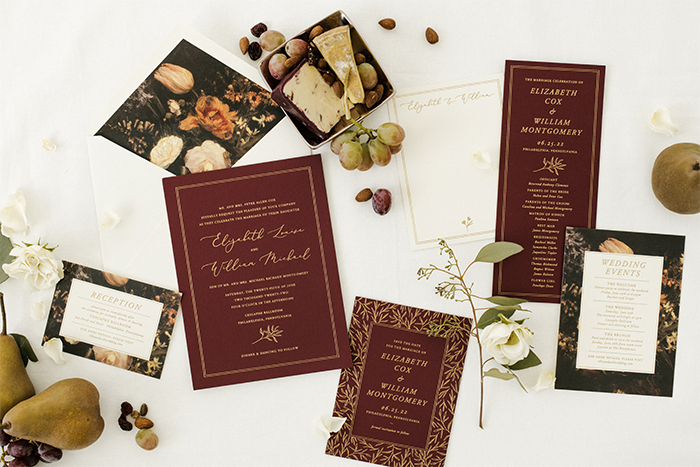 By scheduling an appointment we can guarantee that an invitation specialist will be available to give you personalized attention while sorting through your invitations wants and needs. To schedule an appointment email our Creative Director, erin@smittenboutique.com, or fill out our online survey and we'll contact you for an appointment. We recommend setting up your initial appointment 5 months prior to your wedding in order give you ample time to make decisions, spend time proofing your design, get envelopes back from the calligrapher, assemble and mail everything without feeling rushed. However, we do have the ability to turn things around quicker if your wedding is less than 5 months away. Some of our designers provide digital guest addresses services. If you select a line that doesn't provide the service we can work with a local printer to digitally print your addresses. If you are interested in traditional hand calligraphy we can provide contact info for local calligraphers that we recommend working with.